Research Update: What Are We Learning about Jumping Worms? Invasive jumping worms (Amynthas spp.) continue to be a hot topic in the media, at local garden clubs and plant sales, and in the research community. Ever since jumping worms were discovered at the UW–Madison Arboretum in 2013, marking the first record in the state, we have been a site for research on how these earthworms affect forests and urban gardens as well as potential control options. In addition, we have provided outreach advising citizens on how to help mitigate the spread of these invaders. In September 2017, the Arboretum partnered with the North Temperate Lakes Long-term Ecological Research site (NTL-LTER), UW–Madison Department of Integrative Biology, and dozens of volunteers to learn more about where jumping worms are—and are not—in the Madison metro area. Our goal was to learn more about the types of urban habitats where jumping worms reside. We gathered at the Arboretum on a beautiful Sunday afternoon, divided into more than a dozen teams, and spread out over Madison to survey parks (lawn), natural areas (forests and prairies), and residential properties (both lawn and garden at each site). Participants sampled for earthworms by pouring a mustard solution over a one square-foot area and waited to see if worms emerged from the soil to escape the skin irritant. Although we are still analyzing the data, jumping worms were found in every habitat type, with the exception of prairie. In addition, a new-to-Wisconsin species of jumping worm, Metaphire hilgendorfi, was discovered at two residential properties. This species is commonly found with Amynthas agrestis and Amynthas tokioensis (the two species more commonly found in Wisconsin) in other parts of the country, but was yet to be confirmed in Wisconsin. The Wisconsin Department of Natural Resources (WDNR) is interested in knowing the extent of the invasion statewide in addition to the Madison metro area. To begin answering that question, in October 2017 the Arboretum partnered with the WDNR and Dr. Josef Görres, a jumping worm researcher from the University of Vermont, to create and administer a questionnaire sent to groups such as Master Naturalists, Master Gardeners, Wild Ones, and Arboretum affiliates. The main goal of the questionnaire was to determine where jumping worms have been found around the state, especially in the northern counties, the types of habitat where they are found, how long they have been seen in those locations, and the types of land use practices that may correlate to the worms’ presence or absence. Preliminary results show that the distribution of jumping worms is similar to what we knew already: high abundance in the Milwaukee and Madison metro areas, and common throughout central and southern Wisconsin. However, we also learned that they are found at least in limited areas in many, if not most, northern counties. Arboretum research is also adding to our knowledge of the biology and ecological impacts of jumping worms. 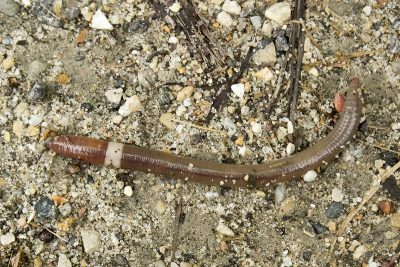 A recent paper by Katherine Laushman, et al, published in the journal Biological Invasions, reports on the spread of jumping worms in Wingra and Gallistel woods. Between 2015 and 2016, jumping worms invaded an additional seven hectares (~17 acres) of forest habitat, and at the same time they displaced European earthworms, suggesting a competitive interaction between the two earthworm groups. This high rate of spread might be attributed to their rapid reproductive rates, possible human transport of cocoons along trails, and/or mobilization of earthworms and/or cocoons by heavy rains in 2016 leading to establishment in previously uninvaded areas down slope. There was no clear correlation between plant species and the presence or absence of jumping worms. Marie Johnston, an honorary fellow in the UW–Madison Department of Soil Science, and I recently completed a study investigating the thermal tolerance of jumping worm cocoons. Since cocoons are only 2 mm in diameter, they can easily go unnoticed in soil and thus can be inadvertently transported from one area to another, resulting in new infestations. We asked the question: Do jumping worm cocoons become inviable at high temperatures? Our research showed that no cocoons contained live earthworms when subjected to temperatures of 40° C (104° F) and higher for at least three days. This means that state standards requiring commercial compost facilities to heat compost piles to at least 131°F for three days should adequately ensure these facilities are not spreading jumping worms. In 2018, we will continue to monitor jumping worms and vegetation plots in Wingra and Gallistel woods as well as at recently added Lakeshore Nature Preserve sites in order to monitor effects over longer time periods. In addition, we will investigate the impact of jumping worms on soil structure and infiltration, and also study the leaf litter and soil temperature requirements of overwintering A. tokioensis and A. agrestis. Finally, we will continue to explore possible control options such as the efficacy of using an organic, low-nitrogen fertilizer called Early Bird, which has shown promising results in a previous pilot study. In December 2017, the Arboretum research unit welcomed Christy Lowney as our new research assistant. With a strong background in forest and plant ecology and extensive research experience, she is a natural fit. Christy’s name may sound familiar—she was previously the Arboretum ranger and so she is already familiar with the staff, volunteers, and other supporters that make this place special. Welcome Christy!